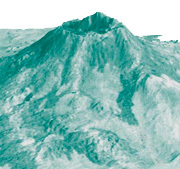 Image above top: Haungaroa seamount terrain model. Many seamounts within New Zealand's Exclusive Economic Zone have been stripped of living organisms above and below the seabed by bottom trawling, in particular from orange roughy and hoki fishing on the Chatham Rise. Now, equally damaging, if not more destructive seabed mining is targeting seamounts on the Kermadec Ridge. Surface mining of the deep seabed will be blind, and damage caused by it will be indiscriminate, catastrophic and long-term. TerraNature Trustee Craig Cary, who is Professor of Environmental Biotechnology at the University of Waikato, and a specialist in extreme hydrothermal vent ecosystems, says "this type of mining will alter geochemistry and potentially cause the extinction of unique microbial flora". "There is a need to protect flora and fauna of the seabed because so much of it is unknown" he said. If mining of the deep seabed proceeds, the real environmental impact of it will never be known, because a value cannot be placed on species that have not yet been discovered or described, and ecosystems that are undefined, that will inevitably be damaged or possibly destroyed. New Zealand is proceeding blindly into the first deepsea mining in the world, with unproven extraction methods, and consequently an unknown return from operations. The sensitivity of seamount ecosystems was recognised, though inadequately, when 19 seamounts including the Rumble III and Brothers seamounts on the Kermadec Ridge, were closed to fishing in 2000 by the Minister of Fisheries, to safeguard the marine life and habitats they support. It is widely accepted that bottom trawling is destructive of seamount ecosystems. Yet equally destructive mineral extraction is now being pursued on Rumble III and Brothers, and many more Kermadec seamounts. The previously closed seamounts were selected according to a draft seamount management strategy developed by the Ministry of Fisheries, with the assistance of the National Institute of Water and Atmospheric Research. The action of one Ministry has very quickly been compromised by another. Neptune Resources describes the deposits of "seafloor massive sulphide" as a new asset mining class which has not been commercially developed anywhere else in the world. This raises the question of how the minerals will be effectively and equitably extracted, and calls for rigorous assessment of the capability of the licensee in undertaking the first operation of its kind. Deep seabed mining has been considered for overseas locations, but has been determined to be economically unfeasible. New Zealand has jurisdiction over the extensive concentration of seamounts and hydrothermal vent fields in the Kermadec-Havre and Backarc System in the Lau Basin, which together with the archipelago group, has been described as the highest productive area of the Southwest Pacific and a centre of global ecosystem reproduction. 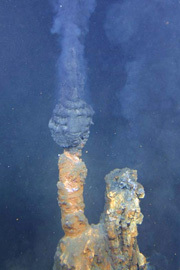 A "black smoker" chimney on the Brothers seamount on the Kermadec Ridge, 1800 metres beneath the ocean surface, emitting a hydrothermal plume of mineral rich fluid. Metals such as copper, zinc, iron and gold precipitate out as fine mineral floccuants, and settle on the seabed, which Neptune Resources proposes to mine. There is a clear consensus amongst the scientific community that deepsea ecosystems perform important ecological functions, in spite of our limited knowledge of them. Deep seabed areas, particularly hydrothermal vents, appear to be one of the origins of life on Earth. The peculiar characteristics of life in these extreme environments offer clues about the evolution of life on Earth. Areas where methane hydrates are found provide an important service in the maintenance of global climate balance, as a result of their function as a greenhouse buffer. The role of hydrothermal plumes in supporting upper zooplankton communities, demonstrates the importance of these ecosystems in the maintenance of the global carbon cycle. 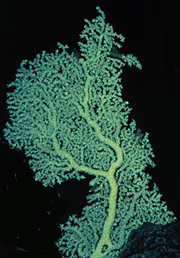 Ecological interlinking has been observed between different deep seabed ecosystems, as well as between the ecosystems of different ocean realms. It is widely recognised that deep seabed genetic resources, as a result of their biological characteristics that allow them to thrive in extreme conditions, hold great potential for various applications, including uses in the health sector, for industrial processes, and bioremediation. Marine species have proven to be efficient in treating diseases such as carcinogenic tumors. It is concurred among experts that the potential of marine genes has only just started to be unveiled. Once identified, the genome of many still-to-be discovered deep seabed organisms will provide information that may be crucially important to various applications.